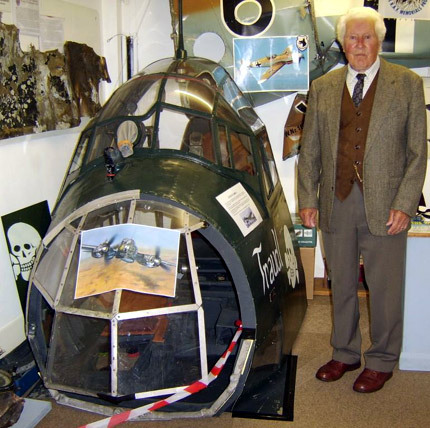 The Museum was delighted to welcome a Luftwaffe veteran who knew a thing or two about Junkers Ju88′s. Erich Schmidt was an Air Engineer and Flight Instructor who initially served on the Eastern Front with Kampfgeschwader 1 ‘Hindenburg’. Later in the war he found himself up against RAF bomber streams with the Nachtjagd including the specialist ‘Wilde Sau’ (Wild Boar) unit formed by Major ‘Hajo’ Hermann, when Ju88′s were used to drop flares to illuminate the targets for single-seater nightfighters to attack. Erich’s luck ended in December 1944 during a ground retreat through Belgium when his truck ran out of fuel and he fell into the hands of the US Army. Being an engineer, Erich was also very interested in the Junkers Jumo engines on display in the Museum, which he once knew very intimately. You are currently browsing the Shoreham Aircraft Museum – News archives for October, 2008.